Of course, the first instinct after watching Book 3 is to compare it to Book 1 and Book 2, its vastly different predecessors. Where Book 1 was a plot-driven crime story inhabiting a vibrant city and its characters, Book 2 was an Avatar-centric exploration of cosmic themes and world-building mythos. Book 1 gave powerful moments to its supporting cast, whereas Book 2 struggled to involve its ensemble with its strong focus on mythology. And where Book 1’s stand-out episodes ramped up the stakes and obstacles through action and reaction, Book 2’s highlights unraveled backstory that underscored the plot events. So, with such a variation between Book 1 and 2, Book 3 could really go in any direction. But it’s nothing so drastic - in fact, it mines a nice blend of characteristics from both previous excursions. Book 3 shares the swift and organic plot advancement of Book 1, with the strong themes and gamechangers of Book 2 - and altogether turns out a damn good batch of episodes. It’s worth noting that Book 3 was able to nimbly rework what didn’t quite gel in the season immediate before - Book 2 struggled with supporting characters, villains, love triangle, and focus. Yet while Book 3 swiftly clears up all of these issues, it doesn’t completely eschew the events of Book 2, as it takes place only two weeks after Harmonic Convergence. Things are different, yes, but they’re different as a direct result of the changes from the end of last season. There are consequences to Korra’s decision to leave the spirit portals open, and there are also repercussions in the Love Triangle, which has drastically shifted in focus. As Korra said, this is a dawning of a New Age, and from the very first episode we understand this to be a world where vines eat buildings and Asami is more important than Mako. This decision to bring Asami into Korra’s immediate circle goes hand-in-hand with a general uptick in the Handling of Supporting Characters. Book 2 wasn’t really conducive for this, and it was lovely to see it carried out so nicely in Book 3. All the characters share screentime together, and most of them are actually relevant to the furthering of the story. Better still is the simultaneous expansion of personal arc for these characters, in a way that progresses with plot. Ventures like Jinora’s spiritual journey, the discovery of Mako and Bolin’s family, and Lin’s history with her sister fill out the season meaningfully and organically. Furthermore, these connections to core characters help facilitate the inclusion of thematic and logistical backdrops such as Zaofu, Ba Sing Se, and the Airbender tradition. Our world is expanded, and our plot greases forward without a hitch, simply because we’re grounded in characters we care about. Naturally, because this is the season of “Change,” these smooth pivots are particularly helpful. But within the narrative, change isn’t portrayed as being so swift - and morever, it’s painted with the specificity of a different word: rebuilding. We begin with the world having to rebuild after Harmonic Convergence, and we end with Korra having to rebuild her body and her identity after giving herself up to Zaheer. In the middle, the Air Nation is rebuilding its ranks, Korra is rebuilding the Avatar legacy, Zaheer is rebuilding the Red Lotus, and characters like Lin and Suyin are rebuilding once-ruined relationships. What’s lovely about this exploration of rebuilding is the inherent complex material that accompanies it. Rebuilding is more specific and powerful than change, because it doesn’t just focus on the difficulties of adjusting to a new present. It also addresses the challenges of leaving behind a forgotten (or unforgettable) past - and the pain that comes with it. How does one rebuild a culture, exactly? How can an Avatar make the right choices without guidance from those who came before her? Can we forgive loved ones who wronged us? What can we let go of, and what must we let go of, in order to move forward into the change? The concept of rebuilding illuminates the internal struggles of characters like Korra, Tenzin, Lin, and Zaheer, but it also regroups the ensemble. Once again, this season does right by the group. Korra’s supporting players are united in a revitalized and connected purpose, from new characters like Suyin, to old characters like Asami, who fell prey to irrelevance in Book 2. All characters - both supporting and main, heroes and villains - are given importance because they plug into a larger thematic landscape: they are devoted to shaping a still-fragile, post-war culture. The only difference between Hero and Villain is method: Korra seeks balance through preservation and revitalization; Zaheer seeks it through annihilation. You could argue that rebuilding is a larger theme of The Legend of Korra as a show, simply because it is set in a world that is teetering on the line between old and new, tradition and modernity, war and unity. But Book 3 brings forth an underlying question at the core of this complex political discussion: is it right for one person to make choices about a group of people? When you remove imposing yet long-standing structures, the one thing that remains is chaos, followed by people attempting to seize or maintain power. Zaheer emerges with a philosophy that is sound in theory, but raises questions of morality when applied to reality. Korra as a Hero is not exempt from this questioning - she makes choices that are sound in theory, but she has to deal with the actual repercussions of them, like public dissent, or wild spirit vines. In both cases, the idea of one making a choice for all creates complications in practice and suggests a portrait little different from an absolute ruler like the Queen. From this aspect, we get a season that is actually highly politicized - and successfully deployed in this structure, where past efforts didn’t quite embody the goal fully. (Tarrlok was wielded as a councilman only briefly, as that role was usurped by his place as the villain’s brother, and the Book 2 politics of the Water Tribes were too complicated and sudden.) In Book 3, though, we begin to fully understand that the Fire Nation and Earth Kingdom are, in fact, monarchies, and that the Earth Kingdom in particular suffers from a huge class divide. 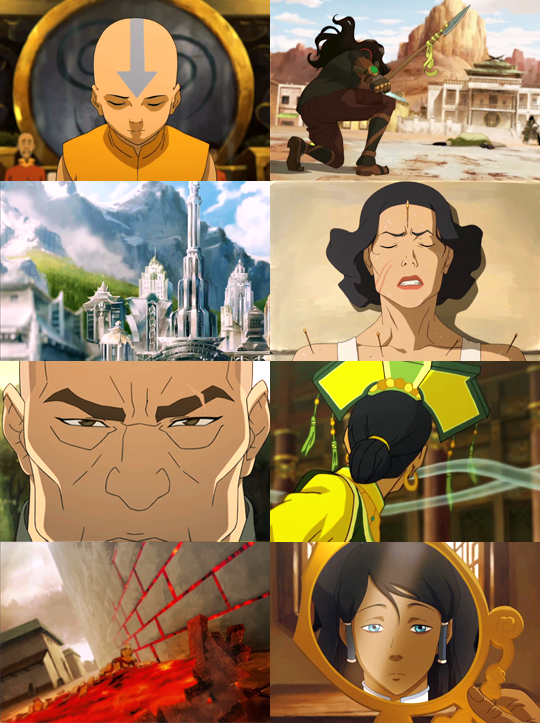 This is shown to the audience organically, through character: we meet the Queen through Korra’s status as the Avatar; we meet the People through Kai, and Mako and Bolin’s family. We know Korra to be of the people, but the Villain claims that he is of the people, too. More than this, Korra’s Book 3 goes one step further from mere government and politics, and explores the relationship between nation and identity. In this New World, the borders are blurred: Republic City is land from the Earth Kingdom, Airbenders are cropping up in Ba Sing Se, and the Queen is using new Airbenders to join her army. In spite of these crossed lines, most people hold allegience to their motherland. Earth Kingdom Airbenders don’t just drop their lives in the Earth Kingdom to become nomads, and Mako and Bolin’s grandma still keeps a portrait of the Queen over her mantle. Identity and nation are intertwined, and this serves as both a tenet and obstacle for Tenzin as he endeavors to conform to Airbender Tradition while bringing in men and women from all walks of life. Then there’s Korra, from the Water Tribes, serving all nations without a past to guide her. She’s also politicized this season, as Episode 1 finds her squarely in the role of Civil Servant. Of course, that role is soon truncated as President Reiko banishes her, and I honestly continue to find myself highly interested in the Avatar’s position Of the People, despite the fact that Tenzin totally shot that down and told her she’s not responsible for people’s everyday worries. Whatever, Tenzin. The Avatar has a public approval rating. I’M HIGHLY INTERESTED. Regardless, politics and identity affect Korra too, as the main character, and by season’s end, we see a huge shift in Korra’s sense of self and power. As a particularly strong-headed fighter, Korra has always derived her identity from her role as Avatar. The title, the power, the abilities. Book 1 saw Korra terrified to lose her bending, and depressed when she was forced to face that reality - briefly, anyways. She’s also still training throughout the first two books. But in Book 3, this is Korra as a fully-formed Avatar. She has a quest independent of self-betterment, and it fittingly results in self-sacrifice. She ends the season with her power completely stripped away because she gave up her entire being - body, mind, power - to preserve the future of the Airbenders. She walked knowingly into that vulnerability, let it completely tear her apart, and now she has to recover from that - visible to the world. So, Korra is left to rebuild, as the new Air Nomads take her place as a power for peace, resolving the question of nation and identity by promising to serve all nations as disciples of balance. The concept of good and evil is no longer represented fundamentally by shapes and Beings, but rather in human shades of power, choice, and agenda. And deeper than this, is the soul of a human, who must weather the natural endings and beginnings that mark everyone’s lives. These themes are spun together masterfully in plot and ensemble, and most importantly - embodied and emblazoned in Korra, the main character whose journey is still the meaningful center of this changing world.